Outdoor enthusiasts: we've mapped every hill and valley for your next great adventure. Now with more detail than ever, TOPO U.S. covers the finer points of the outdooors, with topographic maps comparable to 1:100,000 scale USGS maps. 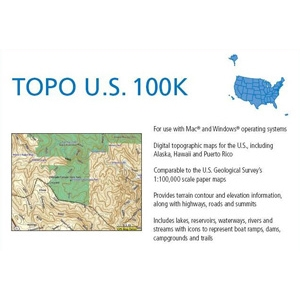 TOPO U.S. includes terrain contours, topo elevations, summits, routable roads and trails, parks, coastlines, rivers, lakes and geographical points. TOPO maps are ideal for hiking, hunting, camping, cycling and communing with nature. Coverage includes topographic detail of the entire United States, including Alaska, Hawaii and Puerto Rico.